A cold snap hits Florida, the price of orange juice rises in supermarkets throughout the country. The weather turns warm in New England every summer, the price of hotel rooms in Caribbean plummets. A war breaks out in the Middle East, the price of gasoline in the United States rises. The law of demand states that, other things being equal, the quantity demanded of a good falls when the price of the good rises. Imagine that you love to eat ice creams. You will eat ice creams regularly if the price of the scoop is $1.00. If all of a sudden the price per scoop increases to $3.00 then you will consume less of it. 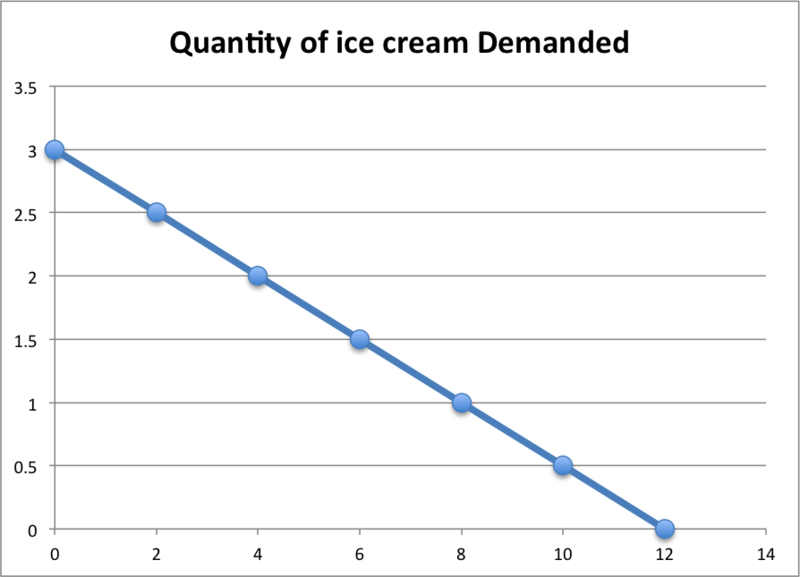 The quantity demanded goes down when the price goes up. Given below is the price of an ice cream cone and the quantity of ice cream cones demanded. The downward sloping line relating price and quantity demanded is called the demand curve. Remember that the demand varies as the price of the good varies, while all other factors are held as constant. 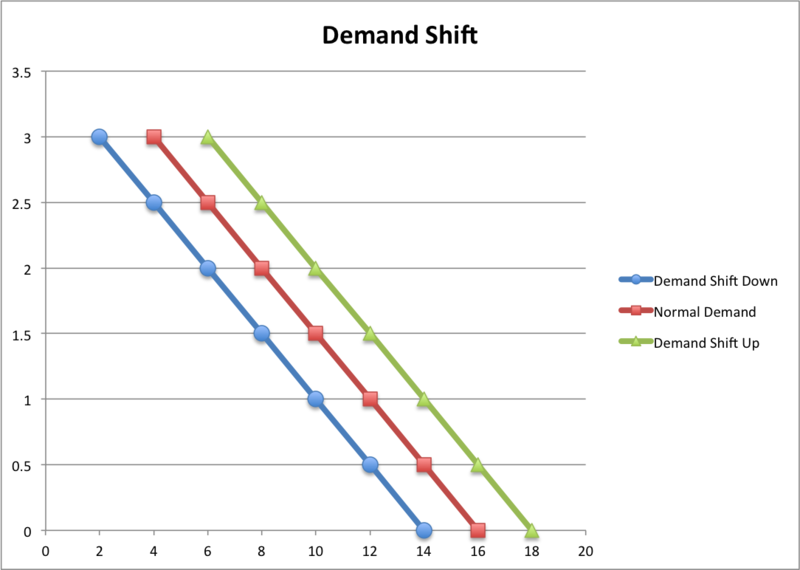 If some things other than price changes the quantity demanded then the demand curve shifts. Any changes to the following items will shift the demand curve. What happens if you lose your job? Your income falls and with that the quantity demanded also falls. If a demand for a good falls when income falls, the good is called a normal good. There are few goods for which the demand goes up even though your income falls. If the demand for a good rises when income falls, the good is called an inferior good. During 2008 recession many people lost their jobs. Lots of them avoided going to bars and restaurants and instead signed up for Netflix subscription. Here is an interesting article about this. I could only arrive at one reason for this phenomenon and that is the millions of the unemployed are using part of their severance and unemployment checks for a bit of entertainment in the form of DVD rentals. I have several unemployed friends doing just that now. Most are foregoing visits to bars and restaurants and instead are sitting in front of their 50inch plasma TVs passing time watching movies. Several of them have subscribed to Netflix. Suppose the price of frozen yogurt falls. The law of demand says that you will buy more frozen yogurt and buy less of ice cream. Why? Because ice cream and frozen yogurt are both cold, sweet, they satisfy similar desires. When a fall in the price of one good reduces the demand for another good, the two good are called substitutes. Suppose the price of DVD player falls. This increases the demand for DVD players and also the DVDs. When a fall in the price of one good raises the demand for another good, the two goods are called complements. If you really like something you buy more of it. If you love eating ice creams you will purchase more of them. Your expectations about the future will affect your demand for a good or service today. Suppose you know that you will get a big raise in three months time then you might purchase a luxury item. If the number of buyers increases then the quantity demanded as a whole will go up. For example if a government health organization comes out with a report that drinking coffee boasts your brain power. The number of coffee drinkers will go up. Given below is the price of an ice cream cone and different amounts of quantities demanded for the same price. The law of supply states that, other things being equal, the quantity supplied of a good rises when the price of the good rises. Imagine you are an ice cream shop owner. If the price of an ice cream is $0.25 then you will stop the supply. Why? You will be running the shop at a loss. On the other hand if people are willing to pay $3.00 for an ice cream you will supply a lot of ice creams. Why? If your cost for one ice cream is $0.50 then by selling it at $3.00 you will make a lot of profit. Given below is the price of an ice cream cone and the quantity of ice cream cones supplied. The upward sloping line relating price and quantity supplied is called the supply curve. Remember that the supply varies as the price of the good varies, while all other factors are held as constant. 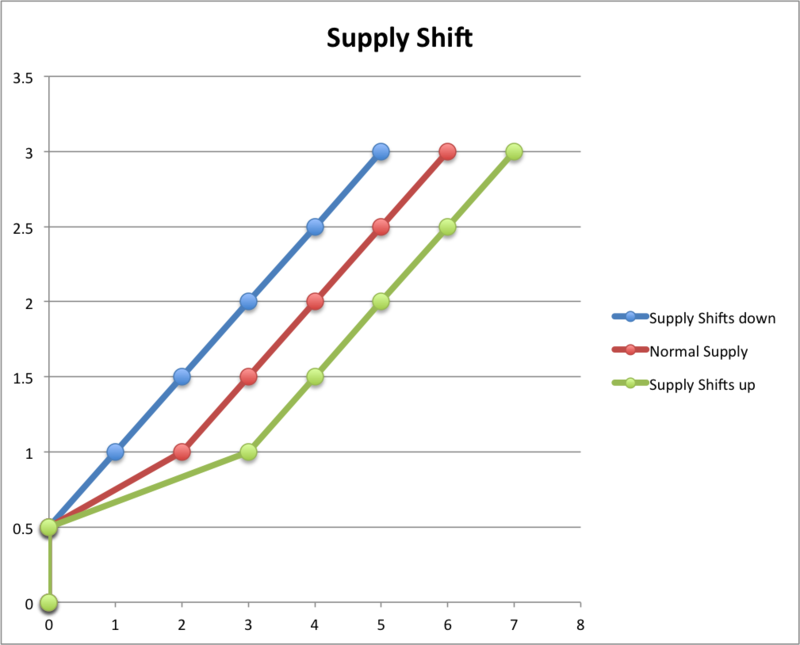 If some things other than price changes the quantity supplied then the supply curve shifts. Any changes to the following items will shift the supply curve. Milk is one of the inputs for making an ice cream. If the cost of the milk goes up then the profit per ice cream sale will go down. Hence the ice cream supply will go down. On the other hand if the price of milk goes down then profit per ice cream sale will go up. Hence the ice cream supply will go up. The invention of mechanized ice cream machine will reduce the amount of labor necessary to make the ice cream. This will result in lower cost and thus increase the supply of ice creams. If the firm expects the price of ice cream to rise in the future, it will put some of its current production into storage and supply less to the market today. 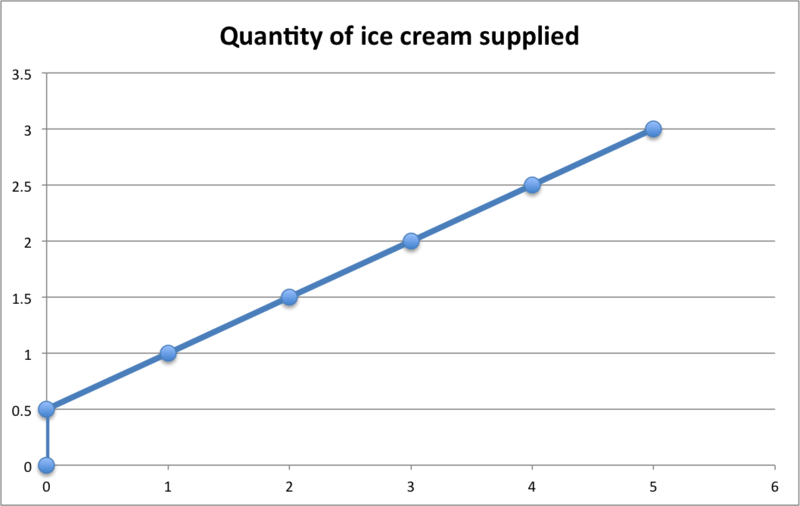 If the number of sellers go up then the supply of ice creams will also go up. Given below is the price of an ice cream cone and different amounts of quantities supplied for the same price. 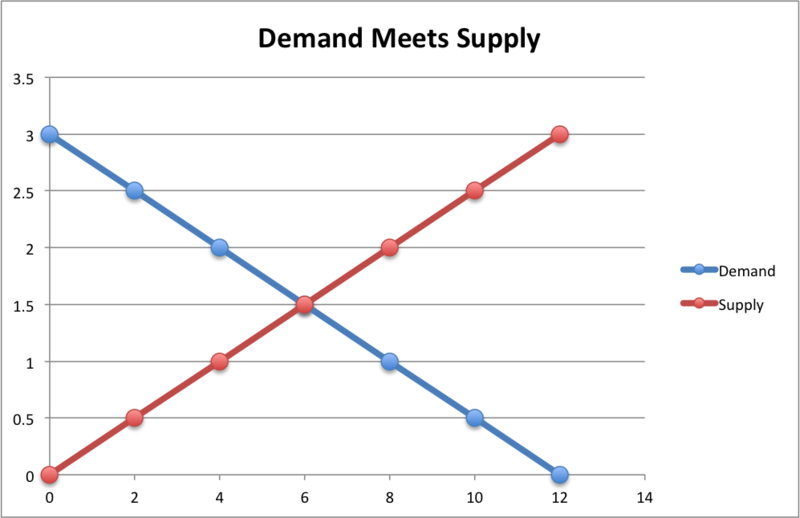 The point at which the supply and the demand curves meet is called as the equilibrium. The price at this intersection is called as equilibrium price. At the equilibrium price, the quantity of the good that buyers are willing and able to buy exactly balances the quantity that sellers are willing and able to sell. If the market price for the good drops to $1.0 then the quantity supplied will be 4 and the quantity demanded will be 8. Look at the table and the graph above. This situation is called as shortage of good or excess demand. On the other hand if the market price of the good raises to $2.0 then the quantity supplied will be 8 and the quantity demanded will be 4. Look at the table and the graph above. This situation is called as surplus of good or excess supply. Regardless of whether the price starts off too high or too low, the activities of the many buyers and sellers automatically push the market price toward the equilibrium price. Once the market reaches its equilibrium price, all buyers and sellers are satisfied. Housing will come back – you can be sure of that. Over time, the number of housing units necessarily matches the number of households (after allowing for a normal level of vacancies). For a period of years prior to 2008, however, America added more housing units than households. Inevitably, we ended up with far too many units and the bubble popped with a violence that shook the entire economy. That created still another problem for housing: Early in a recession, household formations slow, and in 2009 the decrease was dramatic. That devastating supply/demand equation is now reversed: Every day we are creating more households than housing units. People may postpone hitching up during uncertain times, but eventually hormones take over. And while “doubling-up” may be the initial reaction of some during a recession, living with in-laws can quickly lose its allure. At our current annual pace of 600,000 housing starts – considerably less than the number of new households being formed – buyers and renters are sopping up what’s left of the old oversupply. (This process will run its course at different rates around the country; the supply-demand situation varies widely by locale.) While this healing takes place, however, our housing-related companies sputter, employing only 43,315 people compared to 58,769 in 2006. This hugely important sector of the economy, which includes not only construction but everything that feeds off of it, remains in a depression of its own. I believe this is the major reason a recovery in employment has so severely lagged the steady and substantial comeback we have seen in almost all other sectors of our economy. Charlie Munger in his speech on Academic Economics asked the following question. You have studied supply and demand curves. You have learned that when you raise the price, ordinarily the volume you can sell goes down, and when you reduce the price, the volume you can sell goes up. Is that right? That’s what you’ve learned?” They all nod yes. And I say, “Now tell me several instances when, if you want the physical volume to go up, the correct answer is to increase the price? The national secretary of Federation of Medical and Sales Representatives Association of India (FMRAI) Alok Kumar Banerjee has alleged that some multi-national pharmaceutical companies were resorting to the unethical practice of bribing doctors with foreign jaunts and by also giving them costly gifts such as four-wheelers to increase their sales.